It's time to unlock the power of the 7th Generation Intel Core processor with the next generation of award-winning ASUS motherboards - the all-new 200-Series. PC builders of all experience levels looking for an upgrade from Z97 or older chipsets will find the 200-Series to be a welcomed addition in terms of data transfer speeds, with more CPU bandwidth available for drives and support for Optane Memory technology from Intel. Built for the ultimate overclocking experience, the 200-series unleashes the full power of the Intel chipset architecture to deliver a more stable system using 5-Way Optimisation with 1-click overclocking and ASUS' award-winning UEFI BIOS. 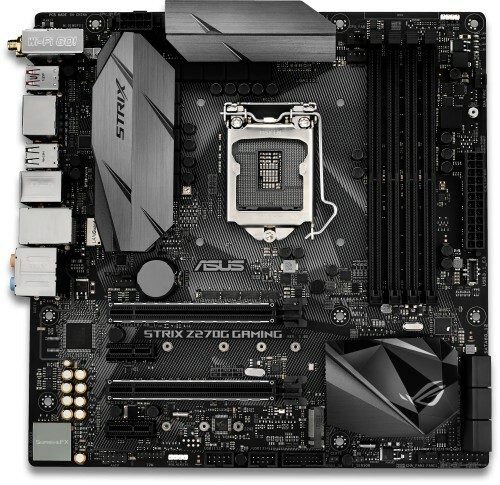 ROG Strix Z270G Gaming motherboards combine bold aesthetics with premier performance and incredible audio to deliver unrivalled gaming experiences and style. Support for the latest Intel processors and technologies, plus exclusive ROG innovations, take performance to the next level to give you the edge against opponents. ROG Strix Z270G charges every movement of every game with thrilling energy and equips you with epic speed and agility. Join the Republic with ROG Strix Z270G Gaming and dominate your game! Create your own custom LED lighting effects with the intuitive Aura software. Cast a stunning multi-color glow across your build with the powerful RGB LEDs built in to ROG Strix Z270G Gaming, or attach separate RGB strips using the two onboard 4-pin headers. You can even use both at the same time and enjoy perfect lighting synchronisation. Fire up Aura and enjoy the creative freedom of nine different lighting themes. You can also make the ROG Strix Z270G Gaming the control hub for your illumination ambitions — so it's easy to synchronise lighting effects between compatible components, including RGB LED strips, graphics cards, keyboards and even mice! ROG Strix's awesome SupremeFX audio technology has levelled up, delivering an exceptional 113 dB signal-to-noise ratio on the line-in connection for best-ever ROG recording quality! 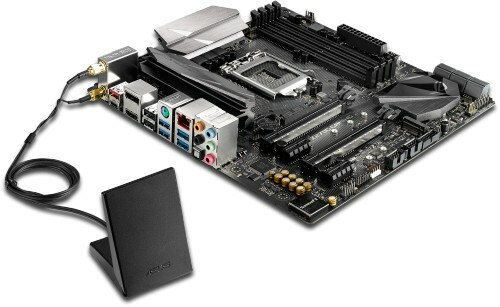 ASUS have also added a low-dropout regulator for cleaner power delivery to the SupremeFX S1220A codec, plus Texas Instruments RC4580 and OPA1688 op-amps for high gain with low distortion. It all adds up to audio that envelops you as never before! ROG Strix's Sonic Studio III audio-effects station has an intelligent routing feature made for streaming. The new routing feature ports streams to different outputs giving you full control over who hears what. With Sonic Studio III, you now can share exciting in-game moments without worrying about frivolous DCMA takedown requests. In addition to that, Sonic Studio III also comes with app-level preferences for instant audio profiles, and improved noise filtering for conversations with total clarity! A dedicated base-clock generator designed for 7th Generation Intel processors allows overclocked base base-clock frequencies up to or beyond 425MHz. This custom solution works in tandem with the ASUS TurboV processing unit to enhance voltage and base-clock overclocking control, — providing an exciting new way to boost performance to extreme heights. With support for DDR4 memory, ROG Strix Z270G Gaming lets you drive memory frequencies to 4000MHz and beyond when overclocked! ASUS-exclusive T-Topology circuit design provides superb memory-overclocking capability to unleash the full power of DDR4 by minimising coupling noise and signal reflection. With innovative equidistant memory channels, T-Topology delivers balanced control and powerful overclocking compatibility. ROG Strix Z270G Gaming features the very latest Intel Ethernet (I219-V) for faster, smoother gaming. Intel's LAN has the serious double advantage of reducing CPU overhead while offering exceptionally high TCP and UDP throughput. This significantly reduces the processor's workload, so there's more power for gaming. LANGuard means safer, more reliable connections for your battles! 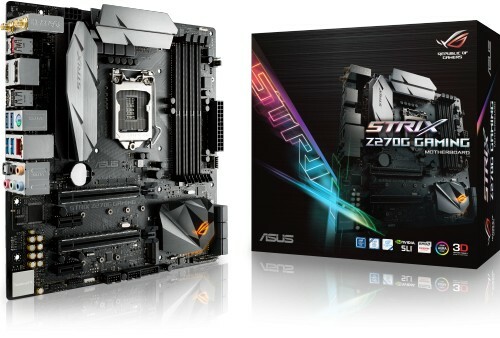 Advanced signal-coupling technology and premium surface-mounting processes join forces to protect your ROG Strix Z270G Gaming's connection and deliver pumped-up throughput, plus electrostatically guarded and surge-protected components (ESD Guards) for 1.9x-greater tolerance to static electricity and 2.5x-greater protection (up to 15KV) against surges! Dual PCIe Gen3 x4 M.2 slots (1x type 22110, 1x type 2280) provide NVMe SSD RAID support for an incredible performance boost. Create a RAID configuration with up to three PCIe Gen3 storage devices via two M.2 slots and a PCIe x16 slot to enjoy the world's fastest data-transfer speeds on the 7th Generation Intel Core platform.